Sierra Bullets is proud to introduce a new addition to the legendary MatchKing® line. Shooters around the world will appreciate the accuracy and extreme long range performance of our new 7mm 197 grain HPBT (#1997). A sleek 27 caliber elongated ogive and a final meplat reducing operation (pointing) provide an increased ballistic coefficient for optimal wind resistance and velocity retention. To ensure precise bullet to bore alignment, a unique bearing surface to ogive junction uses the same 1.5 degree angle commonly found in many match rifle chamber throats. This bullet requires a twist rate of 1:7.5” or faster to stabilize. The new 7mm 197 grain HPBT bullets will be available in boxes of 500 bullets (#1997C) with a suggested retail of $264.21per box and boxes of 100 bullet (#1997) with a suggested retail of $54.20 per box. 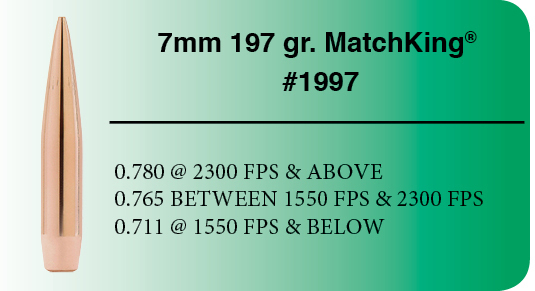 This entry was posted in Competitive Shooting, Reloading and tagged 7mm bullet, new bullet, new MatchKing, Tipped MatchKing. Bookmark the permalink. Looking forward to trying this bullet. Do you have load data available? how about load data for 6.5-06 , sierra 1742 142 gr.